Coming out to your vehicle and finding a new dent is very frustrating. Dents commonly stem from impacts, hail, and a variety of other factors. If your vehicle has a dent, you are likely dealing with a couple of immediate ramifications, including aesthetic and aerodynamic disruptions. However, failing to complete dent repairs in a timely manner can leave your car or truck open to a host of hidden dangers. Drivers across the country can benefit from modern paintless dent repair, a service that relies on precise tools and techniques to pull and buff out dents in a fast, effective, affordable manner. If you are considering whether or not you should get that ugly dent fixed, be sure to consider what you learn in this blog post first. Dent Authority, Inc. is here to serve as your mobile dent repair experts across the country by providing quality service for private drivers, dealerships, body shops, and more. We specialize in car dent removals, and our professional approach ensures that you are left with the best results. 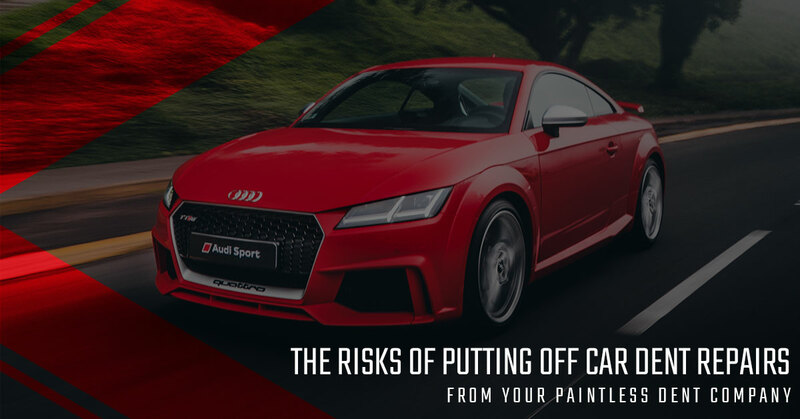 Today, we’ll briefly discuss a few of the risks associated with forgoing paintless dent repairs. If you’re convinced by this post, be sure to contact our team today for assistance! One of the most obvious problems associated with dents is the appearance of your vehicle. Many drivers take pride in their rides, going to great lengths to keep their vehicle clean and in good shape for long-term use and enjoyment. Unfortunately, the aesthetics of your car can quickly take a negative turn if it is marred by unsightly dents. Drivers who invest in off-road accessories and gnarly tires will find that the ugly dents along the cab do more to draw the eye. The most immediate benefit of paintless dent repair is the restoration of your vehicle’s beauty. This service restores the original curvature and shape of the body, resulting in repairs so good that you won’t be able to tell there was damage in the first place! One dynamic that may play a role in your dent repair decision is how it affects the quality and integrity of your ride. In some cases, dents lead to a noticeable change in aerodynamics, often making itself known when you’re filling up at the pump. If dents are in close proximity to trim components, glass panels, or any other critical elements on the vehicle’s exterior, additional efforts may be needed to ensure driver and passenger safety. In many cases, exposed components and bare metals can begin to corrode. This problem can become a major headache for any driver, causing serious damages which require costly repairs to stop the spread of rust. The unnatural angles of dents can create a breach of integrity in your paint’s surface. Over time, dents can become the starting point for degradation, causing the finish to wear down and chip away. Areas prone to high humidity (especially coastal areas) are often designated as high-risk areas for rust. Eventually, your dent will outlast the finish, allowing rust to form on the metal’s surface. This corrosion can eat away at your vehicle’s vital exterior components, compromising its beauty and aerodynamics in the process. Rust can also sap vital areas within the vehicle, creating a serious safety hazard. This can include rust on the frame, joints, and more. Our paintless dent repair services are tailored to restore your car’s body to its original glory, creating a seamless surface for the best protection from future problems with oxidization. Beyond rust concerns, dents can also play a big part when it comes time to sell your vehicle. Potential buyers will be on the lookout for any signs of trouble, keeping doubly alert to ensure that the vehicle is worth investing in. Any cosmetic problems can negatively affect your car or truck’s resale value, as consumers are often very picky about the mechanical and aesthetic condition of used cars. It pays to have us perform car dent removal services before selling your vehicle, as the cost of repairs is often negated by the improvement in sale value. Dent Authority, Inc. can work to provide seamless results for your personal vehicle, commercial fleet, or inventory of for-sale options. Our mobile dent repairs are tailored to be the best in the industry, relying on our proven services and quality craftsmanship to restore your car’s body without the need for paints or fillers. If you’re interested in learning more about paintless dent repair, be sure to contact our team today!